This Nigerian food is very similar to the basic Nigerian Jollof Rice. But it looks better and has a slightly different aroma and taste to it due to the added vegetables. Why not try something different for dinner by adding just 2 well-known vegetables? You can use only drumsticks or chicken breast. You can use rooster or cockerel (male chicken) but hen (female chicken) tastes better. Prepare the tomato stew. Visit the Tomato Stew page for details on how to do that. It is advisable to prepare tomato stew before hand and keep in the freezer. This is so that whenever you want to cook any jollof rice related dish, it is just a matter of adding it to your cooking. If you will use whole chicken then wash and cut it into pieces. Cook with the thyme, Knorr cubes and 2 bulbs of onions (chopped). The cooking time depends on the type of chicken. The rooster or cockerel cooks much faster than the hen but the hen is definitely tastier. When done, grill it in an oven. You may also fry it. This is to give it a golden look which is more presentable especially if you have guests for dinner. Parboil the rice using the method detailed in parboiling rice for cooking jollof rice. Rinse the parboiled rice and put in a sieve to drain. 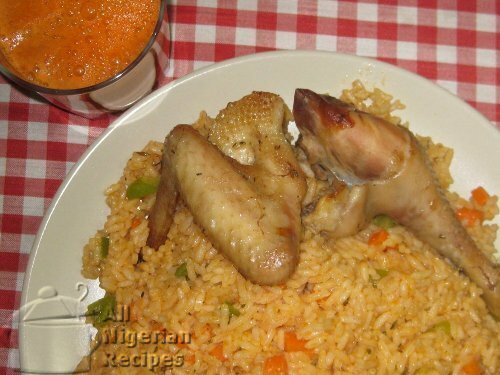 Follow the cooking directions for the classic Nigerian Jollof Rice till Step 3. When the water is almost dry, add the diced carrots, cover the pot and continue cooking. When the water is completely dry, turn off the heat. Add the diced green pepper and stir the rice with a wooden spoon. Why can't we add the green pepper when we added the carrots? This is because green pepper is a soft vegetable so even the slightest heat is enough to get it done. If added at the same time as the carrots (which are harder) they will become dull and unappetizing by the time the water is completely dry. So to keep the green pepper green and looking fresh, we need to add them when we have turned off the heat. Do you see the change in your Jollof Rice? This we achieved by adding just 2 vegetables. Isn't it interesting? If you have any questions about cooking the best Nigerian Jollof Rice, click here to ask me. Serve with Fried Plantain, Nigerian Moi Moi, Nigerian Salad or Coleslaw.